AMSOIL has products for all types of bikes including Harley Davidson, Buell, BMW, Honda, Ducati, Suzuki, Triumph, Yamaha, Kawasaki, KTM, Kymco, Moto Guzz, MV Agusta, Piaggio, Victory, AJS, Aprilia, Victory, Can-Am, Husaberg, Indian, Triumph, and more. AMSOIL synthetic lubricants are performance-formulated, not cost-formulated. In fact, AMSOIL synthetic lubricants often contain materials that other oil makers don't include in their formulations simply because of cost considerations. But the AMSOIL emphasis on product quality pays off for the customer with longer-lasting, better-performing cars, equipment, and lubricants. In fact, AMSOIL users who extend their lubricant drain intervals actually save money over what they'd spend on conventional lubricants changed at conventional drain intervals. 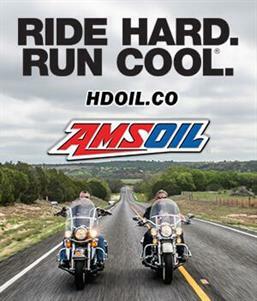 AMSOIL Synthetic Motorcycle Oils outperform other conventional and synthetic motorcycle oils. Their exceptional high-temperature film strength provides maximum wear protection in the most demanding operating conditions. Engineered to prevent damaging sludge and carbon deposits, AMSOIL Synthetic Motorcycle Oils promote superior engine cleanliness, while delivering excellent wetclutch performance and transmission protection. They resist acid formation and provide superior rust protection, which is especially important during storage. AMSOIL Synthetic Motorcycle Oils not only provide superior protection for motorcycle engines, they also provide superior gear protection, meeting API GL-1 and SAE 80, SAE 80W-90 and SAE 90 gear lube requirements. Made from synthetic nanofiber media, AMSOIL Ea Air and Oil Motorcycle Filters trap and hold more contaminants than other filters. They last longer, stop smaller dirt particles and offer reduced restriction for maximum engine performance and protection. AMSOIL 20W-50 Synthetic V-Twin Motorcycle Oil provides superior protection and performance for recent models of Harley-Davidson bikes, but older Harley engines require a different oil. AMSOIL delivers products that perform in all Harleys, including AMSOIL SAE 60 Synthetic V-Twin Motorcycle Oil and AMSOIL Synthetic V-Twin Transmission Fluid for classic Harley models. There is nothing quite like jumping on a big V-twin and hearing that rumble. The fresh air and freedom to go anywhere you choose brings unmatched satisfaction. Nothing kills that feeling faster than a noisy transmission or an overheated bike. AMSOIL V-twin products are engineered to address the specific demands of V-Twin motorcycles. Advanced synthetic technology protects your bike and the spirit of the American biker. In addition, the intense heat and mechanical action inside a motorcycle engine can cause motorcycle oils to lose viscosity or shear. Bikes that share a sump between the engine and transmission are especially prone to viscosity loss due to shear. AMSOIL Synthetic V-Twin Motorcycle Oil is shear stable and does not thin from mechanical activity. It does an excellent job protecting your expensive bike against wear. AMSOIL 20W-50 Synthetic V-Twin Motorcycle Oil has been updated with labels and packaging that bring it in line with the rest of the V-Twin line introduced last year. SAE 60 Synthetic V-Twin Motorcycle Oil labels and packaging will follow in May. Together they complete the AMSOIL V-twin product line in time for the start of motorcycle season. New labels will be available when current inventory is depleted. AMSOIL Synthetic V-Twin Motorcycle Oil delivers excellent performance in transmissions and primary chaincases, offering the convenience of one lubricant for all three areas of your bike. Some bikers, however, prefer lubricants formulated specifically for their transmission or chaincase. AMSOIL Synthetic V-Twin Transmission Fluid and Synthetic V-Twin Primary Fluid offer excellent performance in these situations. A 2012 Harley Street Bob is put through some of the most extreme heat testing at the AMSOIL Mechanical Test Facility in an effort to see if and when AMSOIL 20W-50 motorcycle oil could fail. Temps rose to 550 degrees, well above the average temp of 280-300 degrees. Watch to see how the oil held up after the extreme testing. Wondering where to buy AMSOIL locally? Can't find everything you need in stock? Did you know that you could get the best pricing, free shipping offers, and the latest formulations by buying direct from AMSOIL Inc.? Products are shipped direct to your door from the nearest AMSOIL distribution center and arrive typically within 1 to 3 business days by UPS. 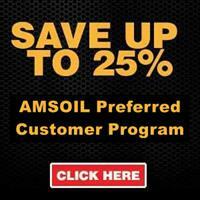 You can get up to 25% off retail prices through the AMSOIL preferred customer membership program. Save your money and your time by buying direct from AMSOIL Inc. online. Powerful, hot-running V-twins generate intense heat, especially in slow-moving rally or parade traffic. Air-cooled bikes rely on a steady flow of air over the cooling fins to conduct heat away. Stop-and-go driving and periods of idling on hot summer days can quickly cause the engine temperature to skyrocket. If a motorcycle oil cannot withstand hot operating temperatures, its ability to provide adequate engine protection is compromised. Get the best oil for your Harley Davison!